You can’t have a Red Riding Hood without a wolf. Here he is, all decked out in Grandma’s nightgown. There is a detailed shot in the gallery if you want to check that out too. This guy was designed by my artist friend who also designed Red. I think they make a great pair. Although Red seems to be a little scared of Granny Wolf, with good reason, he has big teeth. I’ve been trying to buckle down and get this blog up and running. Writing a bio, getting photos taken, and thinking about what I can put in the shop. 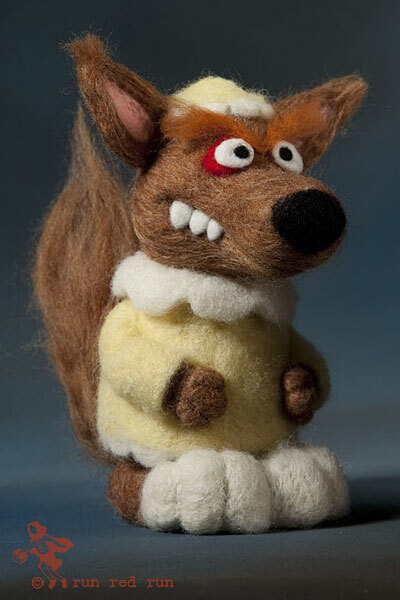 And now that I have that stuff done, I can concentrate on more wool sculpting. Hopefully, I’ll have a work in progress to share soon. I’ve been working with an artist friend on a lot of projects. He draws them, then I sculpt them. 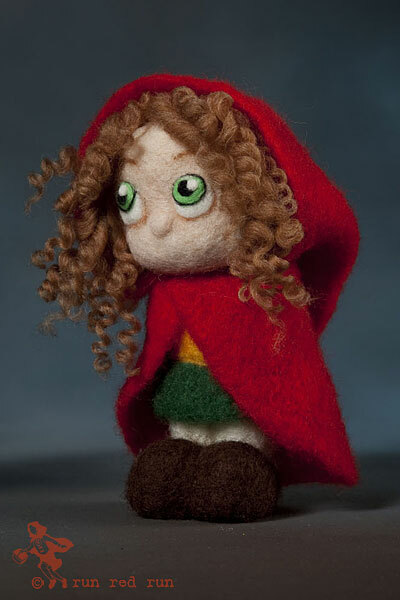 It’s fun to see the sketch come alive into wool character. Stay tuned for more on that. For now, here’s Red. Since she’s the mascot for this site, it only seems right that she’s the first post on this new blog. Depending on the response I get, Red may end up in the shop at a later date. But for now, she’s just here to be cute. Hope you like her.